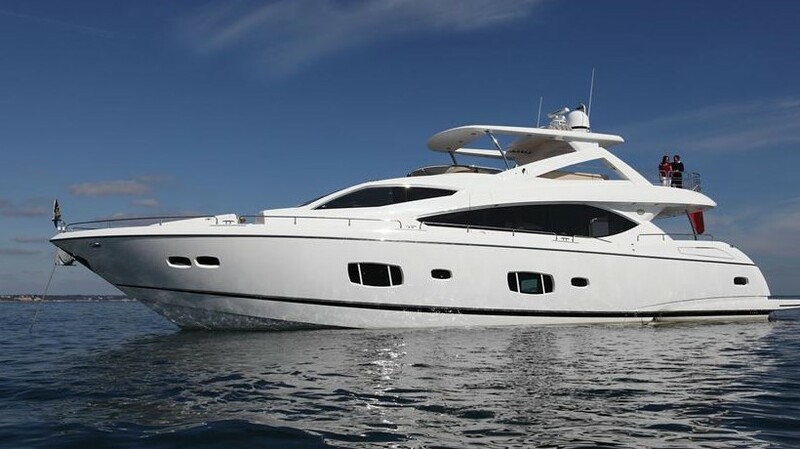 This spectacular Australian delivered 2012 Sunseeker 73Manhattan flybridge motor yacht presents immaculately with exquisite finishes and furnishings throughout. The inventory is comprehensive and includes every conceivable option. Boasting a hardtop to the flybridge with expansive electric opening sunroof perfect for stargazing. This dual station stunner with hyd. thrusters, state of the art joystick controls and an aft docking station is a dream to drive and maneuver. Featuring 4 spacious and sumptuous staterooms plus crew this is the entertainer for extended family and friends. Open saloon, dining and galley with gorgeous timbers and leathers contrasting for the ultimate luxurious feel. Professionally maintained by exacting owner to a fastidious standard, this 73 Manhattan will not disappoint on inspection. Recent antifouling and out of water servicing, nothing to spend or add, just step aboard and start cruising. Exceptional value, priced to sell with current replacement at $7 million plus. Phone Central Agents and arrange to view this exceptional vessel, to fully appreciate the quality. Full specifications and photo file available on request.